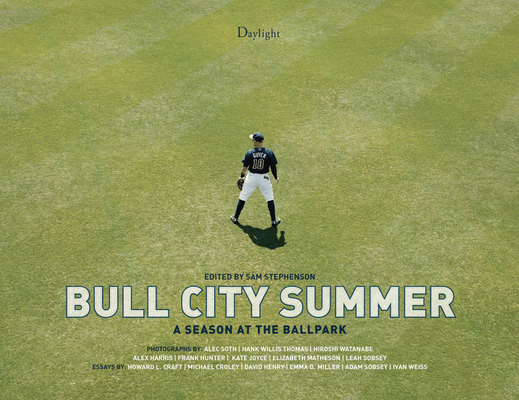 Bull City Summer: A Season At The Ballpark unites a group of artists and documentarians (Hiroshi Watanabe, Alec Soth, and Hank Willis Thomas) around the 2013 season of minor league baseball in Durham, North Carolina, evoking an atmosphere described by The New York Times as "lazing out on the porch of a summer's night and meditating to your favorite ball team." Alec Soth (b. 1969) is a photographer born and based in Minneapolis, Minnesota. His photographs have been featured in numerous solo and group exhibitions, including the 2004 Whitney and S o Paulo Biennials. Soth has been the recipient of numerous fellowships and awards, including the Guggenheim Fellowship (2013). In 2008, Soth started his own publishing company, Little Brown Mushroom. Soth is represented by Sean Kelly in New York, Weinstein Gallery in Minneapolis, Fraenkel Gallery in San Francisco, and is a member of Magnum Photos. Hank Willis Thomas is a photo conceptual artist working primarily with themes related to identity, history and popular culture. He received a BFA in Photography and Africana studies from New York University and his MFA/MA in Photography and Visual Criticism from the California College of Arts. Thomas has exhibited throughout the U.S. and abroad, including the International Center of Photography, Galerie Michel Rein in Paris, Studio Museum in Harlem, Galerie Henrik Springmann in Berlin, and the Baltimore Museum of Art, among others. Thomas' work is in numerous public collections including The Museum of Modern Art New York, The Solomon R. Guggenheim Museum, The Whitney Museum of American Art, The Brooklyn Museum, The High Museum of Art and the National Gallery of Art in Washington DC. Born in Sapporo, Hokkaido, Japan in 1951, Hiroshi Watanabe graduated from the Department of Photography of Nihon University in 1975. Watanabe moved to Los Angeles, where he worked as a production coordinator for Japanese television commercials and later co-founded a Japanese coordination services company. Watanabe obtained an MBA from the UCLA Anderson Business School in 1993. Two years later, however, his earlier interest in photography revived, and Watanabe started to travel worldwide, extensively photographing what he found intriguing at each moment and place. As of 2000, Watanabe has worked full-time at photography.